Here at Web Wiz we take uptime very seriously. We are so confident in our backup contingency plans that we offer a 99.9% Uptime Guarantee. To maintain constantly high standards and service availability our network is monitored round-the-clock from a 3rd party network. In the unlikely event that the monitoring services do detect a fault our 24/7 technicians are alerted immediately. 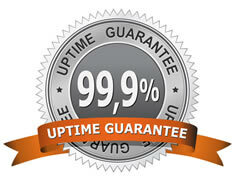 This Uptime Guarantee applies to 'Web Wiz' Website, Forum, Reseller and Cloud Server Hosting customers. If in the unlikely event that our network connectivity fails for more than 0.1% of a calendar month, we will credit one day's service fee for every hour over 0.1% of a calendar month it is unavailable. The maximum credit will not exceed 100% of the monthly service fee charged for the affected month. Network uptime is calculated at the end of each month. In order for you to receive a credit, you must request such credit by 7th day of the following month in which you experienced network unavailability. You must request credit by contact Hosting Support through your Client Area account. The body of this message must contain, the dates, times and the nature of the issue, and your account user name. Credits will be granted within seven days of your credit request if Web Wiz confirms the unavailability. 2. Circumstances beyond Web Wiz reasonable control, including, without limitation, acts of any governmental body, war, insurrection, criminal activity, sabotage, embargo, fire, flood, strike or other labour disturbance, unavailability, interruption or delay in telecommunications, DDoS or other attacks on our network.